Creamy desserts are a perfect foil to showcase millet—they provide enough cover to hide the small grain from plain view yet plenty of appeal to highlight its delicate, toothsome texture. 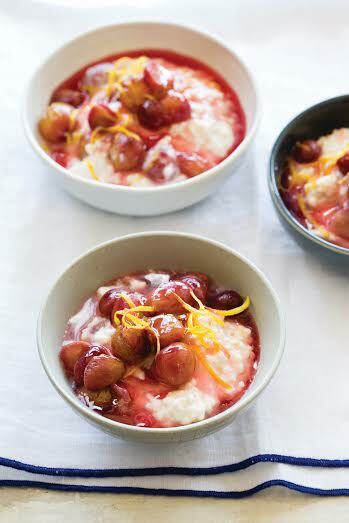 This nimble lemon-infused dessert, similar to rice pudding, is a case in point. Aromatic white wine syrup caramelizes the grapes and ties the ingredients together, showing off this comforting ancient gluten-free grain. To prepare the millet, add the water and the millet to a small heavy saucepan and bring to a boil. Decrease the heat to maintain a simmer, cover, and cook until the water is absorbed, 18 to 20 minutes. Stir in the milk, vanilla, and salt. Return to a simmer, cover, and cook until the liquid is absorbed, about 10 minutes more. Remove from the heat and let sit, covered, for 5 minutes. Uncover and allow to cool for about 25 minutes. While the millet is cooling, make the pudding. Add the wine, honey, sugar, grapes, cloves, and the zest strip to a heavy medium saucepan. Bring to a boil over medium-high heat, stirring gently a few times for the sugars to dissolve, then cook at a lively simmer for about 2 minutes to just soften the grapes. Gently tip the grapes into a sieve, placed over a medium bowl to retain the liquid. Return the liquid, including the cloves and the zest, to the pot and bring to a boil. Cook at a vigorous simmer, adjusting the heat as needed, until the syrup starts to caramelize and turns a deep amber color, 7 to 9 minutes. Remove the pan from the heat and set aside to cool for about 15 minutes. To finish the pudding, be sure that both the millet and the syrup are not more thanslightly warm to the touch. Remove the zest strip and the cloves from the syrup (you will have about 1⁄2 cup); set aside 2 tablespoons of the syrup for garnish. Add the remaining syrup, the yogurt, limoncello, and grated zest to a medium bowl and beat with a wooden spoon until smooth. Fluff the millet with a fork and stir it into the yogurt mixture. Gently stir in the grapes as well. Divide the dessert between six bowls and chill, covered with plastic wrap, for 2 hours to allow the flavors to mingle. When ready to serve, garnish each bowl with a few grape halves. Spoon a bit of the reserved syrup on top (stir in a teaspoon of boiling water to loosen it if needed) and garnish with a bit of lemon zest. Fine points: To stand out in the creamy mixture, dark red or black grapes are my first choice here. MAKE AHEAD This dessert can be made up to 4 hours ahead. It tastes best on the day it is made, as millet tends to harden. However, gently warming leftovers—on the stove top over low heat, or at 50 percent power in the microwave—makes a deliriously good breakfast. Reprinted with permission from Simply Ancient Grains by Maria Speck, copyright (c) 2015. Published by Ten Speed Press, a division of Penguin Random House, Inc. Photography (c) 2015 by Erin Kunkel. SHORT BIO: Maria Speck is the award-winning author of the new Simply Ancient Grains and Ancient Grains for Modern Meals (both by Ten Speed Press). Maria’s first cookbook won multiple awards, among them the coveted Julia Child Award from the International Association of Culinary Professionals (IACP), as well as a Gourmand Award. Both the New York Times and the Washington Post named Ancient Grains a top cookbook, and Cooking Light magazine included it among the 100 best cookbooks of the past 25 years. Raised in Greece and Germany, Maria has a lifelong passion for whole grains. She is a veteran journalist and food writer, and has contributed to Gourmet, Eating Well, Saveur, and Gastronomica, among many other publications. Follow her on Instagram @mariaspeck, or visit:www.MariaSpeck.com.